Limited-run, injection-molded plastic kits from the Czech Republic. In the mid-1990s, Attack produced a line of resin models, but those kits are now out of production. In late 2003, Attack began a new series of resin gun kits. They also market a small line of vehicle accessories and decals. 72802 Munitionsfarzeug 38(t) Ausf. H Based on the Pz. 38, this kit has a new upper hull, and open compartment. 72803 Pz.Kpfw. 38(t) Ausf. G Fair kit. Good surface detail. Complicated hull assembly and mediocre fit of parts. Some smaller details are good, others are poor. 72807 LTvz. 38 PzKfw 38(t) Ausf. A Same basic kit as 72803, with additional parts unique to this version. 72808 PzBefWg 38(t) Ausf. B Same basic kit as 72803, with additional parts unique to this version. 72809 PzBefWg 38(t) Ausf. F Same basic kit as 72803, with additional parts unique to this version. 72821 Munitionsfarzeug 38(t) Ausf. M Based on the Pz. 38, this kit has a new upper hull, with rear fighting compartment. 72893 Pz.Kpfw.II Ausf.C "Eastern Front"
72896 Pz.Kpfw.II Ausf.F "Eastern Front"
72899 Pz.Kpfw.II Ausf.F "US Armored School"
FU72-002 Jeep Willys MB "1st CIABG"
72SE02 Mörserzugmittel 35(t) "Special Edition"
72SE05 Jagdpanzer 38(t) Starr "Special Edition"
72SE07 Kl.Pz.Bef.Wg. I Ausf A Early "Special Edition"
72SE08 Pz.Kpfw. I Ausf.A late "Special Edition"
72SE09 Pz.Bef.Wg. I Ausf A "Special Edition"
72SE10 Kl.Pz.BefWg I Ausf.A - late "Special Edition"
72SE11 Flammpanzer Pz.Kpfw. I Ausf.A "Special Edition"
72SE12 Pz.Kpfw. II Ladungsleger "Special Edition"
72SE13 Pz.Kpfw. II Ausf.C "Special Edition"
72SE15 Pz.Kpfw. I Ausf.A - Breda 2cm "Special Edition"
72SE19 Pz.Kpfw. II Ausf.A "Special Edition"
72SE20 Pz.Jag. I 3,7cm "Special Edition"
Tatra V 755 Aerosledge "Special Edition"
This line of resin kits is defunct. 72316 Panzerträgerwagen w/Pz. 38(t) Same as accessory AR04, but comes with Attack plastic Pz. 38 kit. 72317 Schwimmkörper AP-1 w/Pz. 38(t) Same as accessory AR05, but comes with Attack plastic Pz. 38 kit. 72323 German 7.5 cm PaK 50 With ammunition. 72324 German 12.8cm FlaK44 & FlaK trailer Sd.Anh. 72328 German 8.8 cm PaK 43/41 With ammunition. 72330 German 5.0 cm PaK 38 With ammunition. AR02 PRAGA Accessories Resin boxes and helmets. AR05 Schwimmkorper PzKpfw 38(t) Amphibious Tank Does not include the tank; only the floatation devices. 72319 Kitchen Equipment Buckets, bottles, containers. 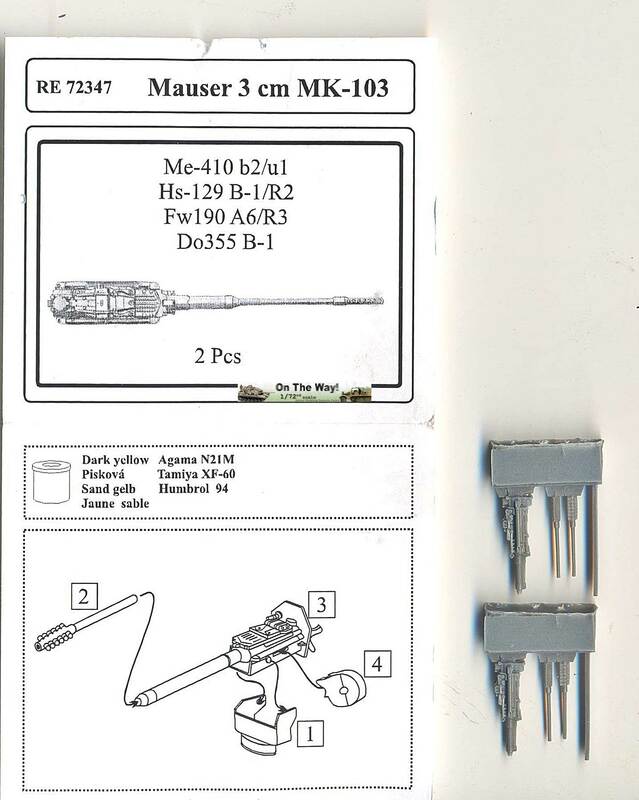 72320 German Ammunition Set #1 Three types of ammunition for 88mm KwK 36 (Tiger), 75mm Pak 40 and KwK 42 (Panther). 72329 Tools Picks, hammers, axes and shovels. 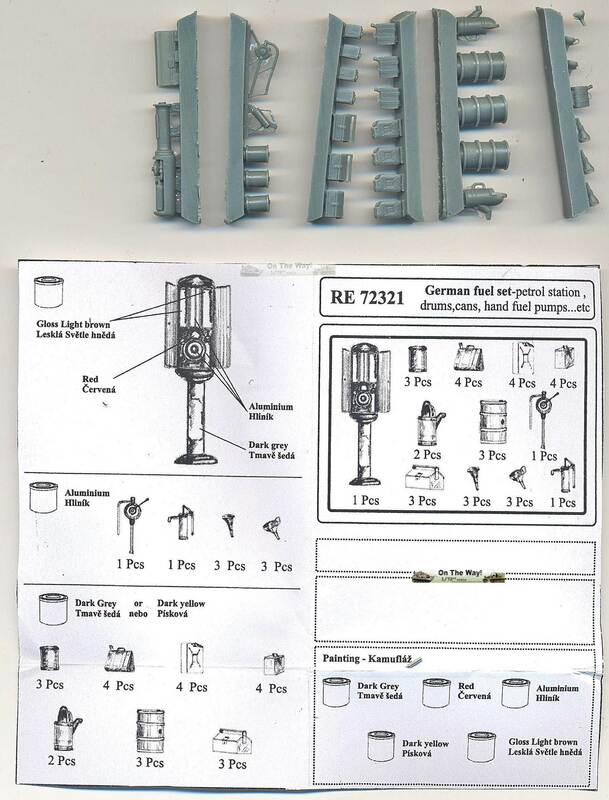 72349 Roadwheels for Hetzer (16 bolts) Eight resin road wheels. Late version wheels. 72901 Rolled Camouflage Nets & Canvas Plastic parts. 72M001 76mm F-34 barrel for T-34/76 and KV-1 model 1941 Turned metal barrel. 72M002 2cm KwK 30 & MG 34 for Pz.II and Sd.Kfz.231, 232, 222 early 2 turned metal barrels. At the time of writing (2016), the only metal barrel available with the cylindrical muzzle of the KwK 30 (as opposed to the conical barrel of the KwK 38). 72M003 M34 barrel 2 turned metal barrels. 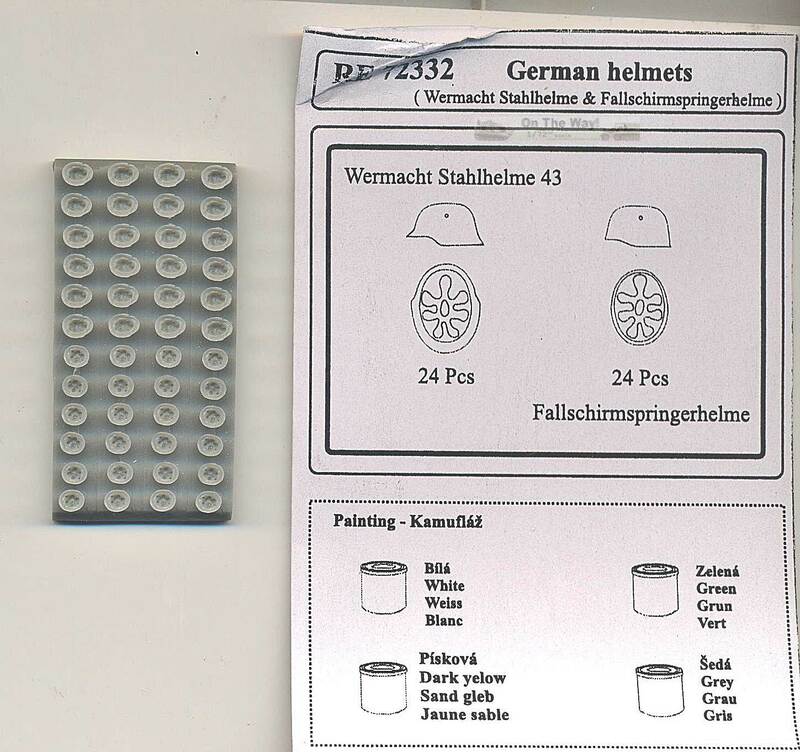 Primarily meant for the PzKpfw I, they might be used to enhance the business end of infantry MG34s .